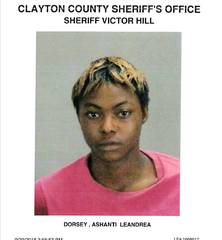 Ashanti Leandrea Dorsey who was ordered to be placed on the top of the list by Sheriff Victor Hill has been captured by the elite Fugitive Squad in DeKalb County. Yesterday on Lakeview Way, Ashanti shot and killed Dontavious Maurice Morrison after a verbal altercation. Morrison was already wanted by Sheriff Victor Hill for charges after leading his Deputies on a high speed chase in the Iron Gate Subdivision before leaving a stolen firearm and drugs in the vehicle he fled from. Ashanti also shot at another man and missed causing him to flee for his life. Ashanti has been linked to a violent crime spree involving other individuals that are being hunted as well while the investigation is ongoing. More information to be released when appropriate.